A couple of days working down in the south-west looking at ongoing projects was a bit of a strain. At Radipole Lake, the reedbed is in the best condition it’s been in for years after a considerable amount of restoration work. 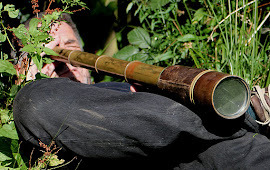 The chance of a booming Bittern this coming spring is as high as it has ever been. It would have been rude of course not to pop in to the visitor centre, where a quick check through the assembled mass of 300+ Med Gulls revealed 2 Ring-billed Gulls. Onward then to Exeter for an afternoon meeting at Goosemoor, a small area of land next to Bowling Green Marsh at Topsham and the site of the first Regulated Tidal Exchange in the UK. Regulated Tidal Exchange is a technique for creating and managing intertidal habitats. It uses regulated quantities of tidal water to manage the inundation regime and is often employed behind maintained sea defences. The technique has been particularly well developed in the eastern USA where impounded coastal wetlands, often in close proximity to built development, have benefited from the re-introduction of tidal flushing. The project at Goosemoor, implemented in 2004, has created a range of saline and brackish habitats (0.75 ha saline lagoon, 0.75 ha of mudflat and 4.25 ha of saltmarsh) for the benefit of breeding and wintering waterbirds. 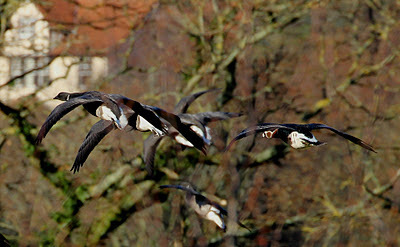 It would have been rude not to pop in to Bowling Green Marsh, just in time for the Red-breasted Goose to fly over our heads and land in front of us. 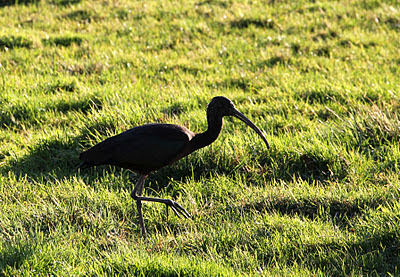 At nearby Exminster Marshes, we looked at the successful use of wild bird cover crops (more of this at a later date), and were forced to endure some extremely close views of the long-staying Glossy Ibis as it wandered around us. The following dawn saw us on Ham Wall, Somerset as a rough half-million Starlings left their roost and cruised over in one sky-wide, minute-long, wing-whirring flock. Two Great White Egrets joined a feeding frenzy of 20+ Little Egrets, half a dozen Grey Herons and a Bittern. Five Bewick’s Swans bugled nearby and an Otter spooked a flock of Tufted Duck. A quick crash around the reedbed to look at the conversion of reed into compost and briquettes was briefly interrupted by a flyover Water Pipit. And finally a quick look at the Somerset Levels was enlivened by the bunch of re-introduced Cranes with their hang-along wild mate (right-hand end, below). Work is a real chore. Top - Taiga Beans and others. Middle - Wigeon making the habitat unsuitable for Taiga's. Bottom - Pinks (at least they were close). Northern people are supposed to prefer brown sauce while southerners go for the red stuff. Not for the first time, I pondered this piece of mythology the other day whilst waiting for the Taiga Bean Geese to become rather more than distant dots on the far side of Buckenham Marshes and for their little mate, the Lesser White-fronted Goose to appear. What prompted this deep, re-sauceful thinking you may ask? Well the Taiga’s are feeding predominantly on Buckenham rather than Cantley this winter. Only two locations regularly support populations of wintering Taiga Bean Geese in the UK: Buckenham and Cantley Marshes in the Yare Valley, Norfolk, and the Slamannen Plateau in Scotland. 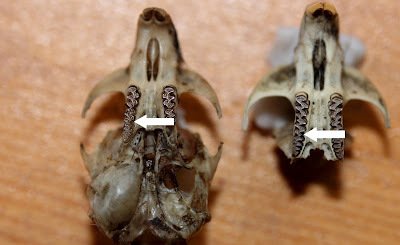 Ringing results have suggested that the two populations breed in different parts of Scandinavia. 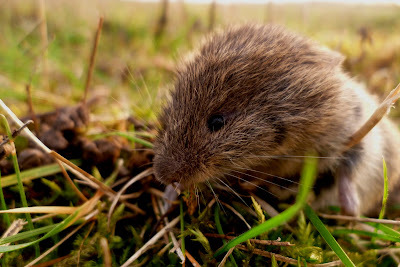 The majority of the individuals visiting central Scotland probably belong to a fully wild sub-population, which is distinct from the one wintering in Norfolk. Part of the central Scotland flock may also derive from a re-introduction project, which started in 1974 in central Sweden. The Scottish birds tend to arrive in October. By contrast, the Norfolk birds appear to leave their breeding area in Sweden for a wintering/staging area in Denmark, before a proportion move on to the Yare Valley around the end of the year. Now to the brown sauce, red sauce conundrum. 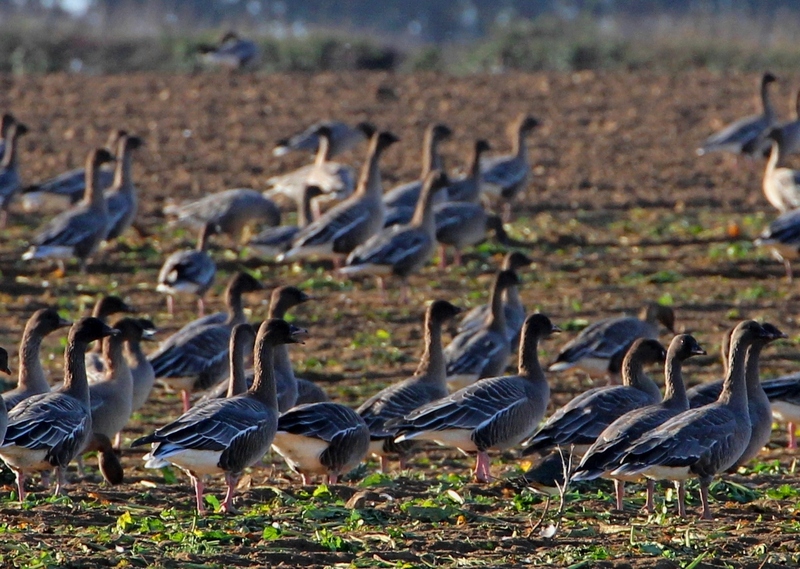 Taiga Bean Geese have been using Buckenham and Cantley Marshes since the 1930s with numbers peaking at 1,000 birds in the 1936-37 winter. Research has indicated that the Yare Valley Taiga’s prefer to graze on unimproved pasture, feeding particularly on meadow-grasses (Poa spp). It is suggested that the large body size of the Taiga (and their disproportionately large guts) allows a more effective digestion of taller, poorer quality food than their smaller-bodied competitors. A shift from preferring Buckenham to Cantley during the 1970s was associated with a shorter sward on Buckenham resulting from increased grazing by Wigeon and sheep. As a result a proportion of the fields at Cantley are maintained to this day at a longer autumn sward height especially for the Taiga’s. By contrast, research on the Slamannen birds has shown that they feed on ‘improved’ grass fields and particularly on Rye Grass (which is apparently less digestible for the Yare Taiga’s). So how comes two populations of birds of the same species, breeding in the same country, can be so different in their digestive traits? Hmmm confusing. Now, there is a clue to all this in the name – ‘bean’. So called, because on the continent they traditionally feed on arable farmland in the autumn, firstly on stubbles, then on waste root crops, with a shift to cereals and grasses late in the winter. Perhaps at the end of the day the research should be seen as just a ‘snapshot’ of what is happening. 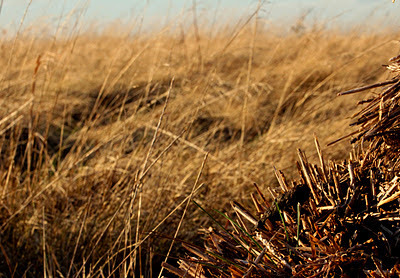 Grass-feeding waterfowl will specialise on the most energetically efficient area of food determined by their body characteristics. And a number of factors will also affect where the birds choose to feed, not least disturbance, to which Taiga’s are apparently sensitive. The Bean Geese will choose to feed on what is most nutritious and available in their traditional wintering areas given the conditions that prevail. But quite clearly you can’t have brown sauce on a burger ....and red sauce on bacon is a complete no-no wherever you come from. Arrh, there’s the Lesser White-front. A total of 90 species seen throughout the valley in a thrash from bottom to top failed to disguise the dullness of the current situation. Highlights? Not really, just 2 drake Smew, 3 scattered Red-crested Pochards and a Med Gull. Wildfowl numbers are generally very low, with the exception of Gadwall. This winter has produced some high numbers, with the November peak of 500+ on Holyfield now dispersing to other sites. A couple of Ruddy Duck survive. About 30 Goosander are around, mainly in the favoured Turnford Marsh/Holyfield/Nazeing zone. Just 3 or 4 Bittern are wintering at 3 sites (but I failed to find any of them). By contrast 30+ Little Egrets are arriving at the 2 roosts at either end of the valley. No Jack Snipe seen today, but these days all the places they are likely to be found are out of bounds. On the passerine front, winter thrushes were the most numerous birds today, with 500+ each of Redwings and Fieldfares. They seemed to be everywhere. There also seems to have been a recent arrival of Chiffchaffs. I saw three today but up to ten may be at Rye Meads; 7 were ringed yesterday. But where are the finches? Linnet was a noticeable miss today but there seems to be no weedy areas left. Holyfield/Cheshunt area: 2 drake Red-crested Pochard, drake Pintail, Little Owl, 500+ Redwing. Girling: 18 Black-necked Grebes, adult Med Gull, 13 Goosander. Walthamstow Res: 6 Ring-necked Parakeets, 4 Shelduck. Rye Meads: 3 Chiffchaff, Cetti’s Warbler, 2 Shelduck. Amwell: drake Smew, Red-crested Pochard, Yellow-legged Gull, 2 Lesser Redpoll.